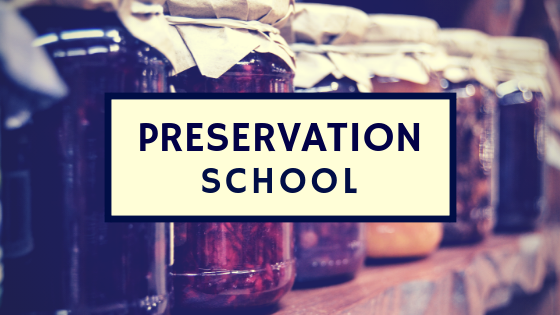 Learn how to preserve fruit and vegetables so you can eat local year round – Preservation School teaches you how to water bath can your favorite foods, including jam, jelly, pickles, salsa, tomato sauce and more. Preservation School is the passion of Amanda Olsen, who has been practicing home food preservation for over a decade. Community, local food and the DIY spirit are at the heart of what Preservation School is all about. Amanda is licensed as a Food Safety Manger in the state of Illinois, and is a Master Food Preserver (through Purdue University Extension’s Master Food Preserver program). Cancellation Policy – classes are non-refundable. If a request for cancellation is made prior to 48 hours of the class, rescheduling the date of an in home class will be accommodated if the date is available. Rescheduled classes must be arranged within 60 days of the original class date. Requests made less than 48 hours before the class are not eligible for rescheduling and are non-refundable. Thanks! I’ve just emailed you. Great! I’ve just sent you an email. Have been trying to email but each attempt fails. Please advise. Hi Nancy – I just received an email from you and sent a reply. Thanks!